I’m going to have to poke Ben to tell me about these things when he finishes them. He’s released his one handed xbox controller. This one was built by request of a veteran of Iraq. He re-designed the layout and re-positioned the entire right half of the controls to make the controls available to a one handed user. How do you get a SUMO bean bag, an iPod, and some sweet hardware to hack on? Submit a design to the Hack-A-Day Design Challenge. You’ve got 22 days to submit your design! no leds , steve’ll be pissed! Steve: huh? You did get credited for the wiimote windows drivers. 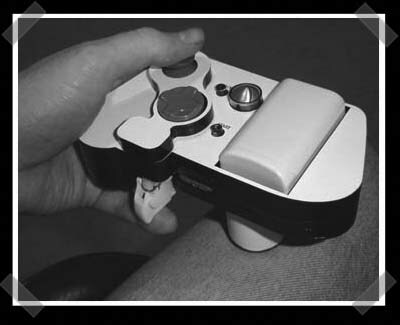 I’d never really thought about console controllers from an accessibility point of view before, but this surely is an issue that needs addressing from an industry viewpoint. Maybe this will be an additional up side to the wiimote, as it removes some of the need for digital dexterity in speaking to a game. I have a friend of the family who has MS and is now quite restricted by it, all this kind of inspires me to see if a wiimote and bluetooth might make his PC experience easier. This man is becoming a legend in his own time! The things I see him do in his projects are inspirational. I’m looking at a couple of my own hacks and want to make changes based on some of his component re-mounting techniques now. joel, i would think so. the only problem i would expect from it is that the xyab buttons may be somewhat hard to get used to with the dexterity of a middle finger. a thumb is easy because it is an opposable appendage. middle fingers, though, not so much. i think a cool idea for it would be to make the lower stick mount onto a larger, “u” shaped piece that sits on the leg. a beefier spring would help to center it, and it would act alot like a large joystick. the way it is now seems like it would be really easy to relax your arm a bit, which would put the weight of the controller down on the stick and move it to the side, perhaps deflecting your critical head shot in Halo 2.
by the way, the “comment confirmation box” still needs some revision. on my monitor the text and the background of it are almost exactly the same color. I don’t know what kind of monitor you are using, but even IE works fine here…. Are you sure that the monitor is turned on? Hey, it might be possible to overcome the functional overload of one-handed control by coupling this to something like a dance mat! Okay, not too manly, but functional. And how would this guy play guitar heroes? I wanna see the 1-handed control for that. Great job, as always, Ben. Everything I build can be used with one hand.